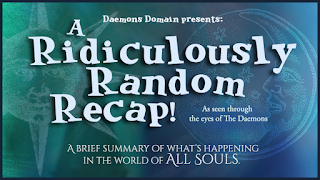 Daemons Domain - All Souls Trilogy & Universe Fan Site + Podcast: Ridiculously Random Recap - Issue 8! Ridiculously Random Recap - Issue 8! Latest News on the All Souls Trilogy and Beyond! Welcome to Issue 8! We are covering the highlights of the summer of 2016 through today. This recap is just in case you missed what we and others have previously covered on Facebook, Twitter, Tumblr, Instagram and elsewhere! Deborah Harkness has gone from a juggling act (professor, author, producer, etc.) to becoming the Ringmaster of her own circus. She’s been writing lots about The Serpent’s Mirror but reported those crazy writing monkeys sometimes want her to write about other stories and characters. Deb said that the Bishops and de Clermonts “continue to be their own stubborn, elusive, and opinionated selves.” Let’s be honest, if she were to author a phone book, we’d read it! Deb and ADOWTV writers are approaching the halfway point in the writing of the first season. They’ve finished the document that lays out all the All Souls Universe -- the characters, settings, plot and the rules for living in that world. Recently, she’s been talking TV with Bad Wolf! She just got back from “three intense and rewarding days with the production and writing teams for the television adaptation of ADOW”, figuring out the minute details of adapting the book to TV. She reports that long discussions have been had about what makes sense to adapt to the small screen, what they can’t live without, and what will have to remain the reader’s mind’s eye. Unfortunately, she can’t break any news about broadcasters, schedules and the like. That will be up to the production team. You can bet we will stay tuned! The Deborah Harkness website has been redesigned with readers and fans in mind. You can stay up to date with Deb’s announcements, events and more. Plus, fans can get interactive with her #tagboard in the Fans Respond section of her website. Tag your social media posts with #DeborahHarkness, and it will show up on tagboard! The real-time reading season is upon us! A Discovery of Witches real-time read along started Sunday, September 18. Readers can grab their All Souls Real-Time reading companions and follow the A Discovery of Witches story in real-time. Deb’s tip to finding your own companion is to do a search for “harkness all souls companion”. There are also real-time reading calendars out there to help readers keep track of what to read and when. The Tenth Knot has a downloadable calendar in their Books/Download section that will take you through the dates in which A Discovery of Witches, and Shadow of Night occurred. Readers are encouraged to share their bookish photos and All Souls locations on social media. Be sure to tag your post with #RealTimeReadingADOW! If you’re still not sure where to start, check out A Discovery of Witches Real-Time Reading FAQs! You can channel your inner Diana Bishop and try to crack the mysterious code that is The Voynich Manuscript. Yale University Press will be publishing a facsimile copy of The Voynich Manuscript this fall. And besides the obvious All Souls connection, our own Deb Harkness wrote the introduction for this book! Check your favorite book retailers for more details! Deb had been bestowing upon us monthly updates on what is happening in her world! The updates have been chock full of information. If you’d like to stay up to date with Deb’s updates, there are certainly plenty of ways to do that: Deb's website, her author page on Facebook, and/or go to her website to sign up for email updates (on the home page ... scroll down). Get the latest delivered straight to your email box! September 12 was the anniversary of the first ever AllSoulsCon. We virtually reminisced about what fun we had that day and looked forward to a future one! Also, fun news from ASC – in honor of Diana Bishop’s birthday, they gifted the fandom with the enitre 2015 AllSoulsCon video. Go to http://allsoulscon.org/ to see the recorded event on-demand. We were quite busy over the summer ourselves, but we managed to hold a series of giveaways! We’d like to give a hearty congratulations again to our winners – congrats to Wendy, Cheryl, Bailee, and our finale winner, Marie! We also held a joint one with ASC for Diana's Birthday - Congrats goes to Debbie for that one! 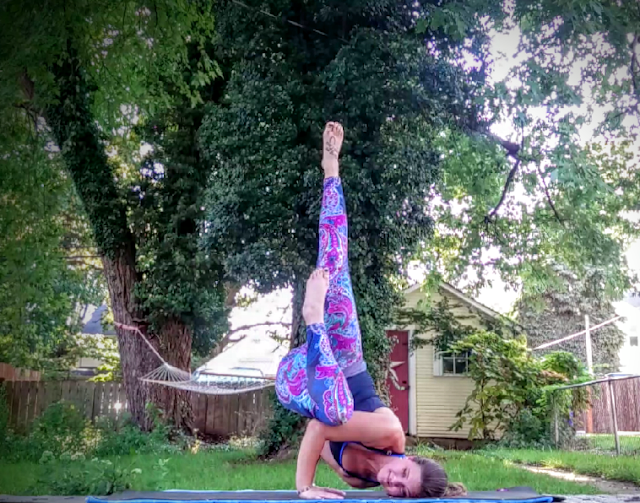 Demonstration (by Aly Davis) of the seemingly impossible pose described in ADOW - pose is called "Fallen Angel"
We had a superb guest writer do a post for us in conjunction with Chapter 8 of A Discovery of Witches – Matthew and Diana’s yoga class together. Friend, fellow All Souls Reader, and Yogini, Aly Davis brought us into Amira’s class and lead us through with her own yoga expertise. She beautifully breaks down what she believes is the "five most glorious pages of ADOW." You can read her feature here: Yoga and the All Souls Trilogy. That's what we have for you this time!